We recently booked our first tropical vacation as a family in 4 years. We did tow our travel trailer to Florida and back last year, but it’s a completely different feeling to hop on an airplane and fly to an exotic location. When we were sitting with our travel agent, Lauren asked what we would need to bring with us. She was only 6 years old when we went on our last vacation 4 years ago, so she doesn’t remember what she packed. I knew this was not the time to talk about this as she would likely forget, so Wendy and I agreed to sit down with her and Rachel and create a checklist of things to bring. For things they needed that we didn’t already have, or needed to be replaced, we would go out and buy them sooner than later. It is important to ensure all of your travel documents are with you when you travel, and you have taken out enough money to use while on vacation. We have a family passport holder/case, that will hold all 4 of our passports, and travel documents (tickets, itinerary, etc). We keep our money, credit and debit cards where we usually do… on us. As well, we make sure we have proper identification for the 4 of us. Also be sure to carry a working pen. It can be rather frustrating when you need to jot something down, and you are searching for a pen. I know most people just reach for their phones and enter it there, which also works, except if you need to sign something, or leave a note. We are a very digitally connected family, and capturing memories is important to us. All 4 of us like to post pictures to our social media channels all the time, especially when we are traveling. Ensuring our cellular plans work where we are traveling is important. Wendy and I both have Rogers Roam Like Home, so we are covered. The resort we plan on staying at has wifi, so the girls can post as well. With that, don’t forget to pack memory cards, adapters, chargers, battery packs, extension cord, and all necessary cables. Putting these items on your checklist is vital if you want to take pictures without running out of memory or battery! Now you must be wondering… “you said you were going to a tropical location… why do you need socks?” It can get cold in tropical islands, especially if you plan to be out at night. I always bring socks, just in case they are needed. As well, I always like to bring a couple extra shirts, just in case. It doesn’t take up too much space, and it is there if you need it. If you plan on going just with carry-on luggage, check the CATSA’s website for restrictions on liquids and other items in your night bag. We usually check our bags, so we don’t have to worry about any of the items on this list. Before packing our suitcases, we print out 2 copies of each person’s list. One copy we use to ensure we have everything packed here. The other copy goes in the front pocket of the suitcase, to cross check everything off as we are packing to come home, so nothing is forgotten. So far, this method has not failed us, and we have never had anything lost. 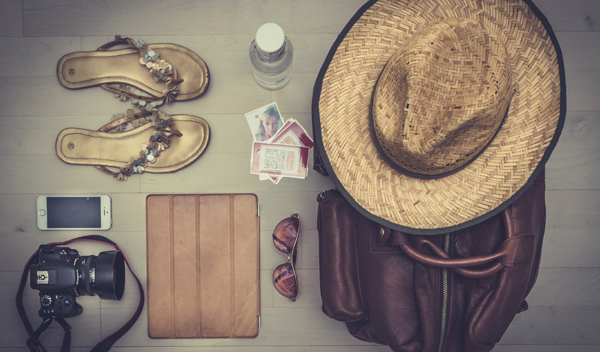 As well, if something gets damaged while on vacation, you can mark it down on the checklist so you know it will need to be repaired or replaced. It’s vacation time! We like to pack a few days ahead of time to ensure the packing part doesn’t stress us out. As well, if we remember we need something, we can run out and get it instead of waiting until the last minute. I hope you find this checklist useful. We customize our checklists depending on where we are going. Duration and location of the vacation play an important part in what gets included. Disclaimer: I am a Rogers social insider. All opinions are my own.